Today I am going to be talking about my maths reflection about my problems that I solved using the questions that I have answered. But I am going to be showing you the question that I did and How I solve it or tried to solve it in more and another way of solve my strategic to answer my question. What I faced about this question was that it found hard to try and think but then I used my head to try and work it out by using multiple way of strategies. 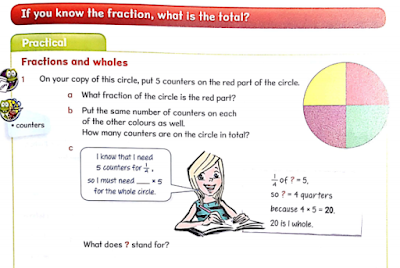 This is the question of my maths topic 'Fractions and wholes'. But this task was a practical because it helps me to practice my Fractions and wholes by using this practical question to solve my work. My first instruction was to draw a circle but of my own copy and then I have to put 5 counters on the red part of the circle and then I had to answer this question, 'a. What fraction of the circle is the red part?'. This question was hard for me to solve because I put 5 counters on the red part and then this question told me to answer which fraction of the rd part. So I think it over the question for the answer and then when I realised that I had found the question that I was looking for. The second question is to 'Put the same number counters on each of the other colours as well. So I put 5 on each part of the circle/colours and then I answered this question, 'How many counters are on the circle in total?'. So I had put my answer down which was 5/4. 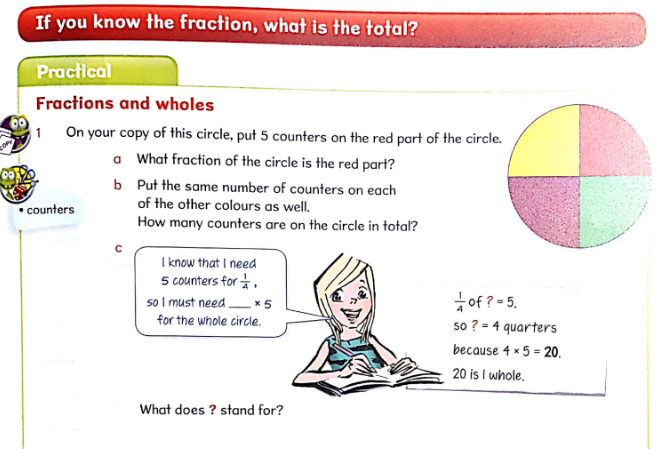 The reason why I put this answer down is because their is 5 counters on each part of the circle and then I figure it out by using the other question that I had answered which was the first task that was shown on the top and then the next ask me about this question 'What fraction of the circle is the red part?'. What I was learning to do was to learn about how to use Fractions & Wholes and also how does work between fractions & wholes. The reason why is because so that I can get better on reaching my goal and high level of maths. This is because so that if I am stuck on a question that struggles me, Then sometimes I can use fractions and wholes to solve my answer or using addiction on my fractions and wholes. That is all for today and I hope you enjoyed this blog post, Please leave comments on one of my blog posts.